Soil Sampling is essential for today’s farmers. Using soil analysis, the farmer can match his/her fertiliser application to the crop requirement taking soil reserves into consideration thus reducing nutrient loss to the environment and increasing farm profitability due to no unnecessary fertiliser and lime applications. Soil analysis is a very small farm expense and will be valid for 5 years. A standard soil test will give the soils pH, lime requirement, soil phosphorus (P), soil potassium (K), soil magnesium (Mg) together with nutrient advice based on soil sample details and results. There is currently no accurate test for measuring soil nitrogen (N) levels. It’s essential to take all nutrients into account in order to get the correct nutrient balance in the soil so that applied fertiliser is taken up by the growing crop, i.e. 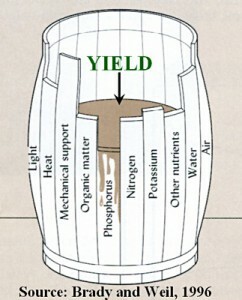 the law of the minimum: The nutrient in the shortest supply determines the yield. The sampling area shall not exceed 4 hectares. Exceptionally, where soil types and cropping of lands were similar during the previous five years, a sample area of up to 8 hectares shall be deemed acceptable. Separate samples shall be taken from areas that are different in soil type, previous cropping history, slope, drainage or persistent poor yields. Any unusual spots such as old fences, ditches, drinking troughs, dung or urine patches or where fertiliser or lime has been heaped or spilled shall be avoided. A field shall not be sampled for phosphorus until 3 months after the last application of any fertiliser containing this nutrient (chemical or organic). The sampling pattern shown in the figure below shall be followed. A soil core shall be taken to the full 100 mm depth. 20 cores shall be taken from the sampling area and placed in the soil container to make up the sample. Ensure the container is full of soil. The field and sample numbers shall be written/attached onto the soil container. Once soil analysis is received it is important to use it! Soil analysis is a very useful tool for increasing farm productivity and profitability while cutting down on nutrient loss.